Most have guessed mad scientist or even crazy waiter (who dresses as waitstaff?!) BUT YOU ARE ALL WRONG. Clearly, THIS KID is an International Super Spy (who wouldn't let me make him a name tag). The INSPIRATION for this getup came from a super-obscure episode of The Backyardigans. For those of you who don't know (how could you NOT?! ), Pablo (who is a bright blue penguin) plays a Bond-esque character (AGENT SECRET!) with a boss named T who must keep three coffee-like containers (of chocolate milk) away from The (evil) Lady in Pink. There's a lot of singing and dancing and general spy-like merriment. You guys. He's wanted to be Agent Secret for MONTHS. And he didn't change his mind ONE TIME leading up to Halloween. 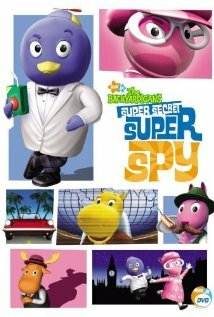 (Trust me, Karl and I half-heartedly tried as we were unsure of where to procure a bright blue penguin dressed as an international super spy costume.) Also, when I showed him his beanie, he asked if it really cut glass (like in the show). I MEAN REALLY. How could you not smile at this getup!? I hope all his future costume requests are this entertaining. The Backyardigans is good TV. Hunter had about a year of it... went on to Yo Gabba Gabba and now it's all My Little Pony: Friendship is Magic. i love that he had such a specific vision! He is so adorable! And pays very close attention to details! Love him. And also the fact that there are obscure eps of Backyardigans. Who KNEW?!? Does it really cut glass. HILARIOUS! Best Halloween costume of 2012 award goes to Nate. haha! That's awesome! He's adorable! My friend said her kiddo (same age) was the same way. He wanted to be a grey dinosaur. Not a blue one. not a green one. A GREY one. Which meant she had to make it. She was like "Great." She took him to the costume place and he was like "Um.. why are we here b/c clearly I'm a grey dinosaur this year." Kids are so funny.